Just a short post today as chores around the house (that I have been avoiding like the plague) have finally become too big to ignore. So, this little update of sorts will have to abide. The Blackwell Witch has been released!!! Thank you so much for all your continued support. The last two days MONSTER FACTORY was downloaded over 1500 times and it even got a few reviews. For those of you that left those reviews, I thank you. I truly appreciate it! Due to popular demand, the release date of THE BLACKWELL WITCH has been moved up from January 1st to TODAY! 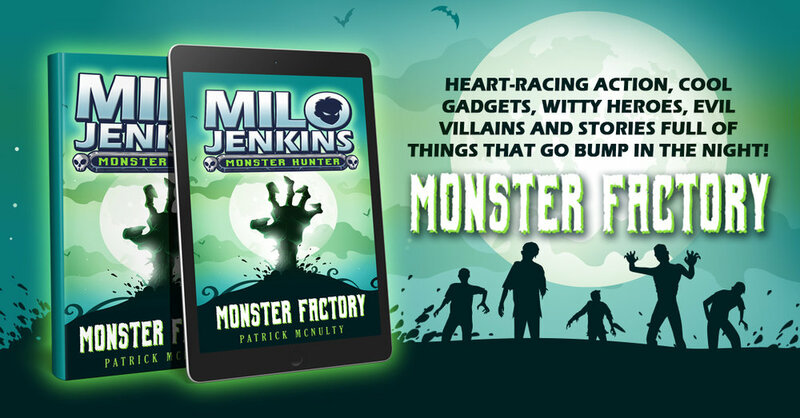 The second exciting book in the Milo Jenkins: Monster Hunter series is available as an ebook and as a paperback from Amazon right HERE! Hope everybody has a great holiday season. Stay warm and keep those you love close. December 7th marks the release of the second story in the Milo Jenkins series: The Blackwell Witch! I am super excited to see what you guys think of this one. It was a lot of fun to write and even more fun because the winner of the “Be in the Blackwell Witch” contest, Betty Reynolds - helped me out immensely with the promotion. Be on the lookout for special pricing and added giveaways coming soon! Stay tuned! In the meantime you can get your paperback copy of the Blackwell Witch today right HERE! December 4th and 5th I am running a FREE promotion on Amazon for MONSTER FACTORY! Get your copy on those days and if you like the story please leave an honest review! GET MONSTER FACTORY FOR FREE! Hello everyone - I hope you're getting into the holiday spirit with all the snow and cold weather. My kids are still small enough to get super excited during this time of year and their letters to Santa and Christmas cheer is infectious. I've come to you today to ask your help. What I need from you is to help me out by leaving a short review on Amazon. MONSTER FACTORY will be FREE on Amazon December 4th and 5th. During that time I'm asking if you could download another FREE copy of MONSTER FACTORY from Amazon and leave a short and honest review. By downloading MONSTER FACTORY from Amazon your review becomes VERIFIED which is very important to Amazon. It means that you as a reader actually went out of your way to purchase this book (even though its FREE to you guys) and liked it so much you had to leave a review to tell people about it. Your﻿ review doesn't have to be long but every positive review is a permanent reminder that this book is worth a readers time and money, and it helps my burgeoning career out immensely. This FREE two-day promotion is all about getting the word out about me and my books and I would greatly appreciate it if you took the time to download a copy of MONSTER FACTORY from Amazon and leave a quick review. Thanks so much and have a great holiday season! LEAVE A REVIEW FOR MONSTER FACTORY! My very excellent ARC Team received an advance copy of the second Milo Jenkins book called, THE BLACKWELL WITCH on Tuesday and I await their comments, questions and concerns. I am madly writing the third book in the series tentatively titled FEAR MACHINE. I hope to have that one finished by the end of December. Hope everything is well with you all and if you are reading this and thinking to yourself, how do I get on the ARC Team - fear not! You too can receive an advance copy of the Milo Jenkins books by simply clicking HERE and signing up! MONSTER FACTORY now available as a pre-order on Amazon! Just a quick word that today marked the first day that my family started decorating for Christmas. I know what some of you are thinking, but trust me, my wife loves Christmas and even getting her to wait this long to decorate took a mountain of convincing. Still, the house looks great with all the decorations and lights on outside. Also, holiday baking took off today with some delicious butter tarts and some chocolate dipped peanut butter balls. Hope you all are getting into the holiday season. A few quick things: Monster Factory has been available on paperback for a bit now, but the ebook will be available for purchase on December 1st. I went exclusive on Amazon and I hope that doesn’t exclude any of my readers. I simply want to give Milo all the help he needs finding new readers and I am betting that being on Amazon is the best move right now. Also, the winner of THE BLACKWELL WITCH contest has been selected and a congratulatory email was sent so if you are that lucky winner please send me a quick response so we can get this ball rolling! Monster Factory in paperback now available on Amazon! Exciting news - after a long struggle with the pros and the cons of publishing wide or going exclusive with Amazon I have decided to stay loyal to the great and powerful Zon and go exclusive. What does that mean for you my much loved fans? It means that I will be running a few special days just for you so that you can download Monster Factory for FREE and hopefully some of you gracious readers out there will be wonderful enough to leave a heartfelt review. As always I appreciate your support, comments and criticisms. Without you I would be writing just for me and my family. Of course, I would do that anyways, but its always nice to hear that someone (other than my mom) looks forward to your new stories! Today we are starting something really fun. I am running a contest and the winner of the contest will be named as a character in the upcoming book: The Blackwell Witch! You can check out the contest details HERE. But I can tell you the name of the game is SHARING - the more you share this contest with your friends on social media the greater chance you have of winning! Also, the winner will receive a signed autographed paperback as well as be mentioned in the acknowledgements at the back of the book! And the best part about the whole thing is that its absolutely FREE! I Hope you enjoy this contest and GOOD LUCK! THE BLACKWELL WITCH is DONE! Hello from rainy Southern Ontario! Yes, it's raining here and probably will be for the next few days which is a perfect reason to stay inside with a warm cup of coffee, tea or whatever and curl up with a good book. First some updates: I've completed the second book in the Milo Jenkins: Monster Hunter series titled: The Blackwell Witch. The book will be going to my editor shortly and ready for my ADVANCE READER COPY team to review. If you are interested in becoming part of my ADVANCE READER COPY team and read the Milo Jenkins books before anyone else click HERE and send me an email. My ARC TEAM (ADVANCE READER COPY team) has been awesome in suggesting story changes and letting me know what they like and don't like in each of Milo's adventures. Their comments and suggestions made a huge difference and made the story much, much better! Next a quick note about reviews for Milo's first adventure, Monster Factory. If you have completed the book and would like to leave a review click HERE and this link will take you to the Monster Factory review page on GOODREADS! I really appreciate you taking the time and every review no matter how short or how long definitely helps! and there is a ton of FREE books there for you to choose from. I've also added all the links below to make it even easier! Hi everyone! Just a quick post to let you know about a new giveaway filled with amazing books. Follow the link HERE to collect your next favourite book for FREE! Outside the weather is cold and rainy and perfect for Halloween! As I finish the final edits on The Blackwell Witch I have begun outlining the newest Milo Jenkins adventure thriller. So far I’ve been calling it: Fear Machine. I’m not sure about the title, but it fits for now. The story revolves around a haunted house that disappears and reappears in different places over time, all over the world. Ive always loved contained thrillers in which the characters are trapped somewhere together. Movies like CABIN IN THE WOODS and REC are a couple I love. Soon I will have the new cover for the third Milo Jenkins story and I’ll reveal it here dear reader. Until then, have a great rainy Sunday and let me know what your favorite underrated monsters? What monsters would you like to see in a future Milo Jenkins story? Always happy to hear from you! Check out the new book trailer for Monster Factory! I’m super excited to reveal the latest book trailer for the first book in the Milo Jenkins: Monster Hunter series - Monster Factory! Check it out on my Facebook page HERE and let me know what you think! Monster Factory is now on Goodreads! 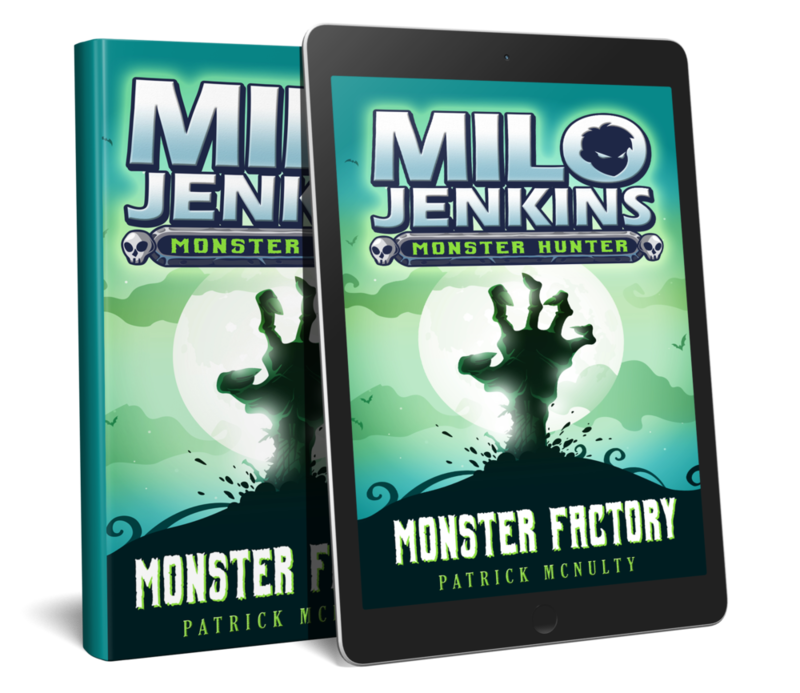 Over the last few days over 400 people have downloaded my new book Monster Factory, the first in the Milo Jenkins: Monster Hunter series. So far the reviews have been positive, but they have just gone to my personal email so I’ve added Monster Factory to the popular book review site Goodreads to let everyone review the book as they wish. As any author will tell you reviews are the lifeblood of a book. Good or bad each one sheds a little light on how the reader views your story. As an author they give me a chance to see my work from a different perspective. What works, what doesn’t and most importantly it tells me what the readers want. I love to write and i’ll do it forever but more importantly I love to tell a good story. If I’ve done that let me know. If I haven’t, tell me why and I’ll do my very best to get better down the line. If you’ve read Monster Factory do me a kindness and leave a review HERE on Goodreads. I would really appreciate it. Middle Grade Thriller Promo Starts Tomorrow! Hi everyone! I created a FREE giveaway promotion for 10 middle grade books! All the books are free to download and enjoy! If you’re in the market for a new book click the image below and start reading your next favourite book or series! For the third Milo Jenkins book I think I will write about one of my favourite sub-genres in movies and books: contained thrillers! Contained thrillers for those of you that don’t know are when a group of people are trapped in a single location (a cruise ship, a cabin in the woods, even a single room) and are asked to complete challenges or defeat the unique tasks assigned to the environment to continue to play or in movies and books - stay alive! I’ve been toying with the idea of Milo and Ruby getting sent to a carnival where kids begin to go missing after entering the haunted house. I’ve always loved going into haunted houses and I think this haunted house is going to be awesome. Scary, but awesome. Stay tuned for more information and updates including cover reveals and all the special extras I have in store. Well, cause they’re awesome. That’s why. Actually, there’s a good many reasons why I choose to write prologues. I come from a screenwriting background and when writing screenplays I was always taught that the hook - or the opening scene - should be the one to reel you in. Readers and even movie-goers have an incredibly short attention span - so you got a very narrow timeframe to get in there - make them feel something about the characters and then - jerk the line to set the hook (it’s a fishing analogy, trust me, I looked it up.). Also, it’s always good practice to shorten the scenes you are writing until there is absolutely no fluff. Like those monster bodybuilders I see in the gym as I walk by with my Cinnabon. Cut, lean, stripped of everything except what you absolutely need. If you can do that (in your story, that is) then you will have a high-octane thrill ride of a narrative that will keep people turning the pages, or swiping the screen, or however you guys and gals read out there. The process is simple, and its the same principles as attending parties in person. Get in late and leave early. Start the scene at the height of action and then leave just before the conclusion leaving the reader wondering…what happened? I hope they are okay? etc. If someone reads your first chapter and has a bunch of questions about the welfare of the characters you have done your job as a writer. Speaking of writing and stuff, Monster Factory is currently on Wattpad. Give it a read HERE and let me know what you think. By no means am I an expert on anything, writing included, but I get up every day, grab my coffee and keep hitting the keys because that’s what I love to do. As always I love hearing from you and I read every email. Contact me HERE and keep sending me suggestions for future Milo Jenkins books - they are awesome and I am definitely going to use most of them. If I use your idea in a book I will include your name in the acknowledgements! Become a character in the next Milo Jenkins book! I’m running a contest too where the winner’s name will be featured as one of the characters in the upcoming Milo Jenkins: Monster Hunter book - The Blackwell Witch! Check out the poll on my facebook page HERE and like my page to stay up to date on all upcoming releases and special updates! Hey everyone if you’re interested in middle-grade thrillers you can check out my FREE giveaway link on Prolific Works called MIDDLE-GRADE THRILLERS! This link includes 5 FREE books including Monster Factory! So get your FREE BOOKS today! MONSTER FACTORY NOW ON WATTPAD! 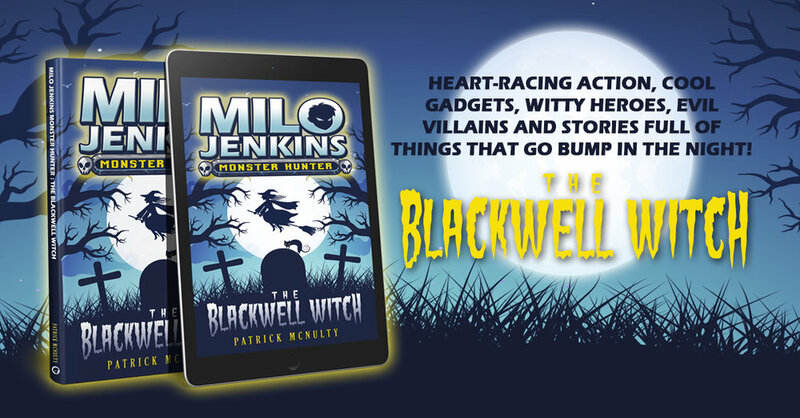 As I write and polish the next book in the Milo Jenkins: Monster Hunter series called The Blackwell Witch I have put up Monster Factory on Wattpad for your reading pleasure. Give it a read and then tell me what you think! Clink the link HERE to read Monster Factory on Wattpad.